Well... we came to the end of the wonderful 'Focus on Life' challenge. Sally prompted us to talk about 'Goodbye' but that is a word in my vocabulary I use sparsely :) I don't like goodbyes, although logically I agree they are necessary. However, I'll take this moment to thank Sally for hosting the Focus on life challenge: it has made me look deeper inside myself, reach in and bring my best out, week after week. And I would also like to thank all of you, my visitors - I enjoyed enormously your comments and your presence. The journey is always better when you have company, and you've all been a wonderful company! My word of the year has been 'Bloom' and I did a lot of blooming in many aspects and directions. Very fittingly my mom's last packet contained some lovely scraps of leather: in splendid colours, and various shapes. As soon as Christmas Day arrived and I opened it - a number of flowers fell into my lap. One of them - the most beautiful shade of turquoise. Along the flowers - a number of leaves too! Some matching the flowers, some not. 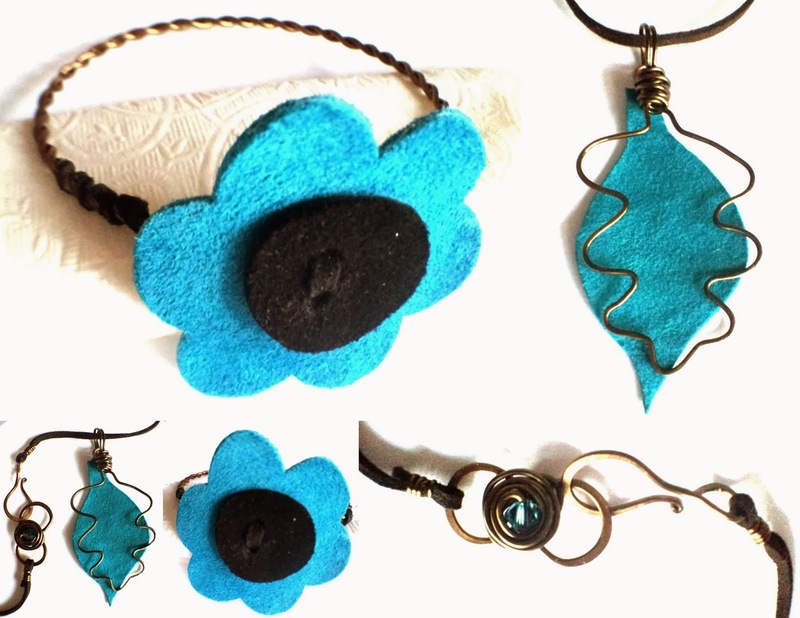 This is my farewell for a year of blooming: with a flower and a leaf, and a rose-like clasp (the link on the clasp is adapted from Cindy Wimmer's book: The missing link) in my favourite colour, in my favourite wire (antique bronze). Offering you my blue flower on this last week of 2013 - and wishing you to have a wonderful 2014! May all your wishes come true (so be careful what you wish for!) and may you be healthy and joyful! We fear saying goodbye as we don't like "shutting a door", but, of course, God will "open a window" as the saying goes. I can't wait to see where that open window leads you in 2014, Alicia! What a gorgeous finale! That's on of my favorite colors as well! I have enjoyed getting to know you each week Alicia. Thanx for sharing. I wish you the best in 2014. Your turquoise flower is lovely. What beautiful scraps your mom sent you and you turned them into treasures. Happy New Year! Lovely colour! So cheerful compared to what we arrived home too, broken trees and ice everywhere. Our car was locked in ice in the long term car park at the airport! Best wished in 2014? are you continuing on the Focus on life Journey? Beautiful job, Alicia! Sometime this week while I am off, I will get the picture of my ornament posted as well...thanks again, have a wonderful 2014! My favorite colors! Happy 2014! A very sweet gift from you mom. I just love the color of these little bits. Wishing you a Very Happy New Year! Beautiful! I love, love, love a blue flower... so many though are purples pretending. Now I'm all curious, do you have a word picked out for 2014? I'm sure it will be a great year! What a lovely surprise from your mom, and so fitting! As always, really beautiful work - and stunning wire work! love that closure! I'm not much for goodbyes either, but I know I don't need to say that to you as I will be seeing you for sure in 2014 my friend! Hope you are having a wonderful holiday and wishing you a wonderful 2014!